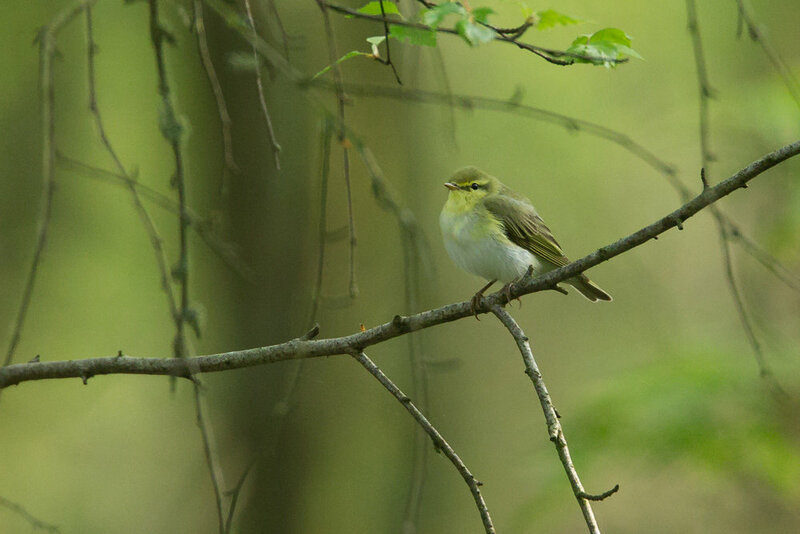 THE ACCELERATING TRILL OF A WOOD WARBLER is one of the most evocative sounds of spring in East Lancs woodlands but it is sadly all too rare these days with usually only a maximum of 2 or 3 per year. Punctuated occasionally by 'teeoo-teeoo' calls similar to a bullfinch, a hissing trill reverberated through a small patch of birch woodland as I opened the car door at Stocks Reservoir early on Sunday morning. Bam! I was hoping for an interesting shorebird last weekend but this will do nicely instead. Wood Warbler's song is very familiar, having listened to it many times in Clockburn Dene near my home in Gateshead as a child. I've also heard it all over Eastern Europe, where it is happily still very common. It is even on my cumulative garden list, if you can have such a thing, with one singing from a railway embankment behind my flat in Hitchin, Hertfordshire in the early 90s. I have found a few in East Lancs since I moved here in 2005 but I don't see it every year as they have become very scarce across much of their range in England so every one of them is a real delight. Sadly this bird was gone by late morning so maybe just a migrant passing through? Just in case anyone is interested, particularly bearing in mind the attention the Olympus 4/3 set-up is getting, the file info for the photo above is: Canon 1DX, 700mm, ISO3200, f/6.3, 1/200 sec. (handheld).